Dette rolige get-away har tre romslige soverom, alle med eget bad, king-size-senger og fantastisk havutsikt. Den generøse Hovedsoverommet har hans og hennes garderober, air condition, TV, DVD-spiller og en privat sjøutsikt terrasse å stille slappe av eller nyte den spektakulære solnedgangen. Master en-suite bad med badekar, dusjkabinett, hans og hennes forfengelighet vasker og et stort vindu med utsikt over områdets frodige planter. Dette luksuriøse og komfortable villaen er utsmykket med moderne møbler og myke møbler. Salongen huser en 42 tommers flatskjerm-plasma-TV sammen med en DVD-spiller mens WiFi-tilkobling kan bli funnet og dratt rundt hele huset og balkong områder. Ligger i første etasje er et fullt funksjonelt kjøkken med kokeøy, kjøleskap / fryser, mikrobølgeovn, stekeovn og keramisk koketopp. Utendørsbassenget med romslig bassengkanten er det perfekte stedet å kjøle seg ned etter en dag med øya utforsking. Ko Samui er en øy full av eventyr og skjønnhet, med en rekke aktiviteter både på land og i havet. Det finnes noe for alle - fra en avslappende yoga klasse til en eventyrlig elefant trek til en fantastisk dykk i noen av de mest uberørte vannet i verden. Du kan bare slappe av på villaen eller komme seg ut og gjøre en av de mange aktiviteter rundt øya. Island aktiviteter inkluderer øya safari, snorkling / dykking, windsurfing, slange gårder, jungle / elefantridning, hav / tropisk padling, ridning, strikkhopping, canopy eventyr, paintball, firehjulinger, fiske, kite surfing og speed båt utleie, turer til omkringliggende øyer, thailandske matlagingskurs, yogatimer. Dersom en fredelig, rolig, rolig og komfortabel get-a-måte er det du leter etter, så Pai Chon er det perfekte stedet for deg. Bygget i en bolig gated community, er Pai Chon bortgjemt i den frodige fjellsiden vekk fra støy, trafikk, forstyrrelse og turister. Vi er stolte av å opprettholde denne rolige omgivelser, og din rolle i å bevare standarder for dette fellesskapet er meget verdsatt. We stayed at the villa Pai Chon for 2 weeks in January 2017 and loved it! The house is very spacious, tastefully decorated and we felt at home right from the start. It is very quiet and peaceful and the only noise you hear is from the birds in the trees. From the upstairs terrace you have a fantastic view overlooking the sea and some islands. A lovely beach and many nice and inexpensive restaurants are located near by - just a five minute ride down the hill. The kitchen is very well equipped so that if you prefer you can also prepare your own meals. It takes about 20 minutes to get to a big supermarket where you have a good selection of European and Thai foods. hopefully see you back soon! So nice, only minus is that you need a car or motorbike to get there otherwise we would give it a 5 star! Nice help from the staff, Clean and cozy. Could definitly stay here again! We are a family of 4 adults who stayed for a week In September 2016 at this villa. The owner, Arjan, was very helpful during the booking process, answering questions quickly and fully. We weren't going to arrive until after 10pm but this wasn't a problem. A driver was at the airport to meet us, arranged as part of the rental, and we had provided a shopping list beforehand and all of our provisions were in the fridge on our arrival. The villa is beautiful with good quality furniture, fittings and accessories making it feel like a home rather than a holiday let. The photographs on the website don't do it justice. There is a wonderful sea view from the master bedroom and from the upper floor balcony. At any time of the day the view is beautiful but the sunsets had us reaching for our cameras every single day. Each of the bedrooms have king size beds and en-suite bathrooms and are very spacious, all with a view of the pool. The en-suite bathroom of the master bedroom has a fabulous bath but what we didn't realise is that it doesn't include a toilet. You need to use the toilet along the corridor which also serves the ground floor. It wasn't a problem but it we would have preferred to have had just one washbasin rather than two and have a toilet instead. The pool is a decent size and the addition of the waterfall feature is lovely. It was immaculately clean and the pool man and gardener appeared very regularly to keep the property in a beautiful condition. The villa manager Au organised for us to have a chef one evening and the food was delicious. However she told us the price per hour and how long the cooking and shopping would take but she didn't mention that 2 ladies would be coming. The meal was fantastic and was a nice experience but it was far more expensive than we expected. Au was very helpful during our holiday but I was disappointed that when we asked her about arranging a trip to the Ang Thong National Marine Park she was using an operator who had the most appalling reviews on Trip Advisor. Ordinarily I would have just trusted the recommendation of the villa manager but having seen that one operator had such an appalling record I decided to check first and I'm very glad that I did. The villa is set high up on a steep hillside and a car is essential. Overall we had a wonderful holiday and would definitely recommend this villa but note that the open staircase is not suitable for young children. very happy you enjoyed your vacation in villa Pai Chon! Wir verbrachten 13 Tagen in der wunderschönen Villa Pai Chon. Es war ein toller Aufenthalt in der Villa und auf Koh Samui. Wir wurden vom Flughafen abgeholt und hatten ein Mietwagen. Es hat alles super geklappt. Die Betreuung vor Ort war großartig. Die Villa ist sehr geschmackvoll eingerichtet und es fehlte an nichts. Auch die Küche ist sehr gut ausgestattet und der Blick vom Balkon ist traumhaft. Die Villa ist so wie auf den Bildern beschrieben. Der Kontakt mit dem Vermieter war sehr nett und verbindlich. Ich kann diese Villa absolut weiterempfehlen. Wir kommen bestimmt wieder. This villa suits travellers who want to chill out rather than be in the crowdie main areas. You will need a car during your stay. The road to the house is a bit steep here and there but a confident driver should have no problems. Advantage of having your own car is the freedom of going anywhere, anytime on the island. I found driving on Samui save and comfortable (much saver to drive a car than motorbikes!). The villa is really nicely decorated, complete and clean. Great pool and view! The manager (Au) is very helpful with anything you need. We went to Maenam beach (15 minutes drive) several times but the nearest beach Bang Por is also beautiful. Even though the kitchen is nice and complete we only used it for breakfast. There are countless good restaurants nearby also for take away or delivery. We had a great stay here so we highly recommend this villa for families and (multiple) couples. Flykte til en eksotisk oase som ligger i de frodige åsene i Koh Samui, Thailand, der tropiske brisen og uberørte strender venter din ankomst. 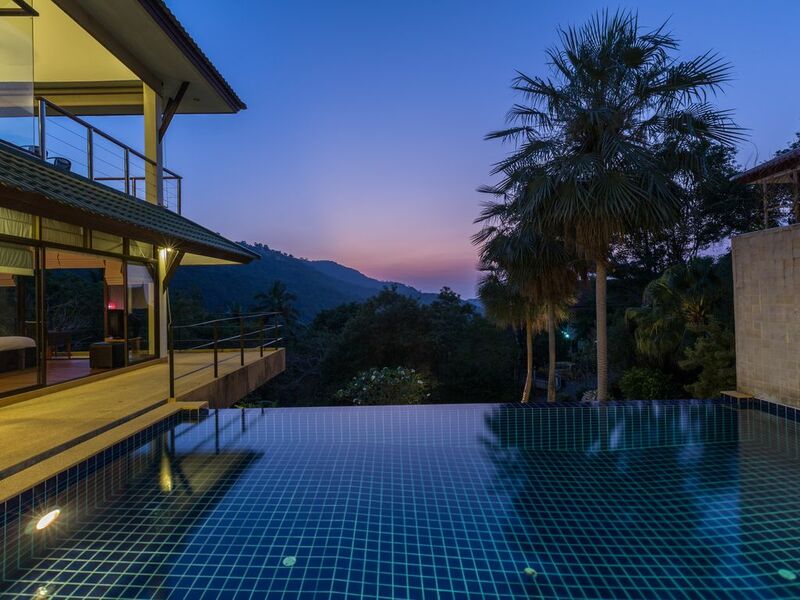 Inspirert av lokal kultur og tilgjengelig for leie, er Pai Chon en sjarmerende villa med utsikt Ko Phangan med utsikt over Gulf of Thailand, kun få minutter fra Chaweng Beach - og ikke så langt (eller for nær) fra shopping, underholdning og uteliv områder.